relenet is a platform to operate web 2.0 social network communities - or what we also call relationship networks - under your own brand. Social networks are modelling human contacts and relationships, as well as the needs, desires, skills, talents, the knowledge, preferences and the offers of its members. The graphic may help to picture a web 2.0 social network or relationship network at a glance. 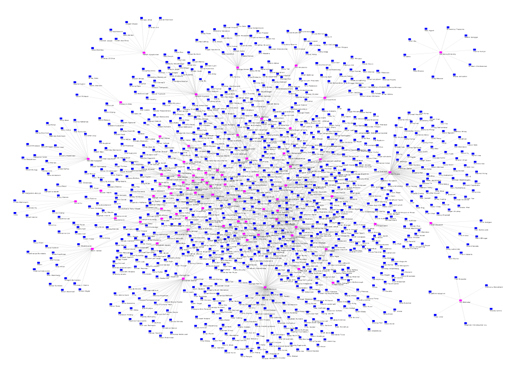 It demonstrates the members of a relationship network (the dots) and the relationship between its members (the lines). 3MFuture operates the platform relenet. It allows for a speedy set up of your own social network or social community under your own brand, i.e. as a whitelabel solution. The relenet social networking platform in addition promises a reliable performance of your site. 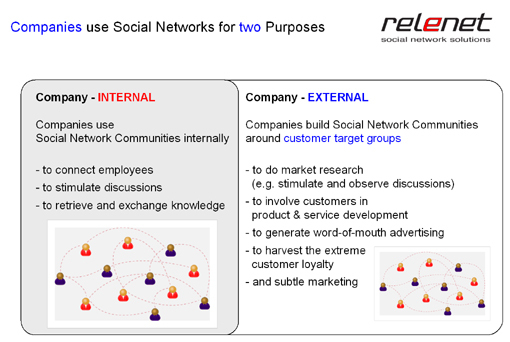 Companies - EXTERNAL - build social networking sites and web 2.0 communities around their customer target groups to do market research, to involve customers in product and service design, to generate word-of-mouth marketing and to harvest the extreme customer loyalty that members of social networking sites exhibit. Clubs & Communities - to help community building and to gain new members. There you will also find our Click-Demo, a Powerpoint slide show depicting the functionalities of the relenet social network communities in five minutes. LungcancerC - the social network community solution that connects patients, clinics, physicians, specialists, relatives to find help.